Sometimes you want an easy way to share your Pingdom monitoring data with others. So far we’ve had public report pages that you can use, but now we’ve added one more sharing method that is very flexible and easy to use. Enter our new “report banners”. With report banners we have made it easy for you to share uptime and response time stats for any of your monitored sites or servers. You can share them with anyone, regardless if they have a Pingdom account or not. A “snapshot” banner for any time period of your choosing. It will not change over time. A “last 30 days” banner that will update once per hour. You can create as many banners as you like. The basic concept behind the report banners is to make it easy for you to share your monitoring data with others. In a forum discussion thread. In emails to colleagues and friends. Anywhere else you can attach or add an image. Example 1: Imagine you’re speaking to your web hosting provider and want to show them how the response time of your website has deteriorated over the last month. Simply create a report banner that shows the response time for the last month and email it to them. An image often says more than a thousand words. Example 2: Proudly show your webmaster colleagues or customers that your website has had 100% uptime over the last three months. We could list hundreds of ways you could use the report banners. The possibilities are virtually endless. 1. Direct buttons in existing reports: You’ll notice that we have added buttons to your uptime and response time report pages, as shown here below. Clicking on the button will automatically create a “snapshot” banner for you for the time period and check you are viewing. 2. The Report Banners page: The other way is to use the Report Banners page to create a banner “from scratch”. 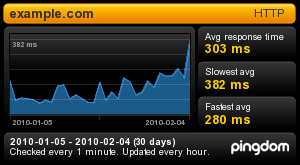 On this page you can create either “snapshot” banners or “last 30 days” banners for any of the sites you’re monitoring. It’s still just a few simple clicks and is very easy to do. 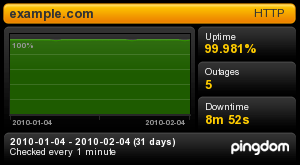 We hope you’ll find this feature a useful addition to the Pingdom server uptime monitoring. Wow! That’s is good feature. Thanks! @Simon: Ouch. We’ll look into it right away. Nice feature! I’d like to see additional functionality in version 2.0 though. How about summarizing of a few different tests into a single report/banner. For example, customer A is served by cluster1 and cluster2. 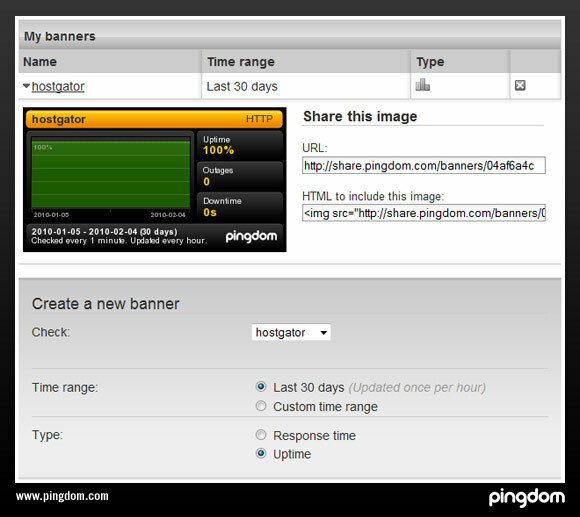 Cluster1 and Cluster2 are both monitored by Pingdom as separate tests. However, customer A doesn’t know what the two clusters are for and they really don’t need to. I need to provide them with a “system-wide” uptime report that is based upon the two tests that relate to them. @Jaison: Thanks for the feedback. We’ve been thinking about doing something along those lines, although if we do, it will be on a more general level for all kinds of Pingdom reports, not just for these banners. But it’s a good idea. Both methods to create banner don’t seem to work in Opera 10.10, at least I was unable to do it with either. @Rarst: We’re currently looking into this. We did some additions before release that wasn’t properly tested in all browsers. Wow, awesome. I love this feature from Pingdom. 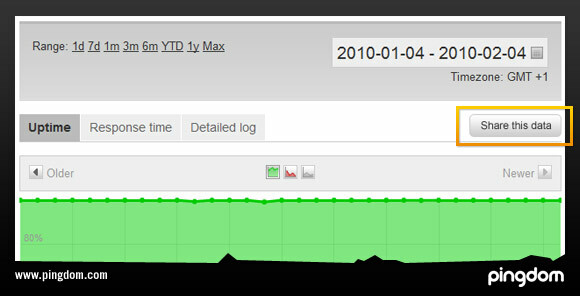 I always want to show my site uptime to my visitors. @Jaison and Rarst and anyone else who had problems in either IE or Opera, this should be fixed now. Still not working for me. Might have cached broken script or something so I will retry later. @Rarst: Did it work out for you? Nope, still not working for me in Opera. 1 Suggestion: Add an option to set 2 banner sizes, because the actual one is very small. It would be great if it could be bigger.